As a general rule, I tend not to eat foods named after wrestling moves. For instance, I wouldn't eat a sandwich called a body slam, or drink a smoothie called a choke-hold. 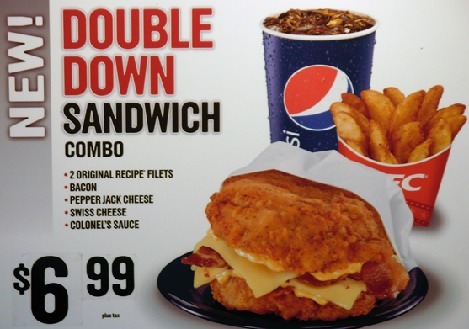 So, you won't find me eating one of these Double Down monstrosities anytime soon. However, I somehow feel compelled to defend this lil' monster. I seriously think that if this were a regular, "double patty" sandwich, with buns, no one would pay it any mind. And that would be even worse for you. I'm just saying, I feel for KFC. They try to make their own sickass hybrid of "low carb" bunless sammy, and get a figurative citizens' (cardiac) arrest for being inventive! When I come out with my own inside-out Peanut Butter and Jelly sandwich filled with bread, I hope people are a little more understanding.